Prior to this release there has never been such a great collection of giants on one recorded session. 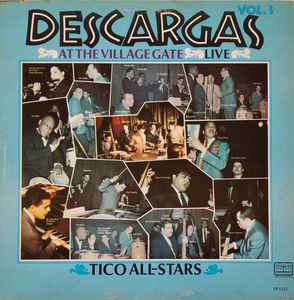 On this LP, you have some of the World's greatest Latin music musicians playing together, as 1 single Orquesta, and was recorded "Live" at the old Village Gate of NYC: Alfred Abreu Tenor sax, Pedro Boulong Trumpet, Joe Cuba Calderon Conga, Candido Camero Conga. Vincent Frisaura Trumpet, Eddie Palmieri Piano, Victor Paz Trumpet, Robert Porcelli Sax, Tito Puente Timbales, & vibes, Bobby Rodriguez Bass, Jose Rodrigues Trombone, Barry Rogers Trombone, Jimmy Sabater Timbales, Alfredo Armentero Trumpet, Ray Barretto Conga, Israel "Cachao" Lopez Bass, Richard Maldonado Piano, Johnny Pacheco Flute, Charlie Palmieri Piano, and Many Others..... This happened at the old Village Gate Night Club in NYC during their Monday Night Jam Sessions. I'm fortunate to have been a part of it.